Most government and standard public health references don’t tell you – so EWG will. 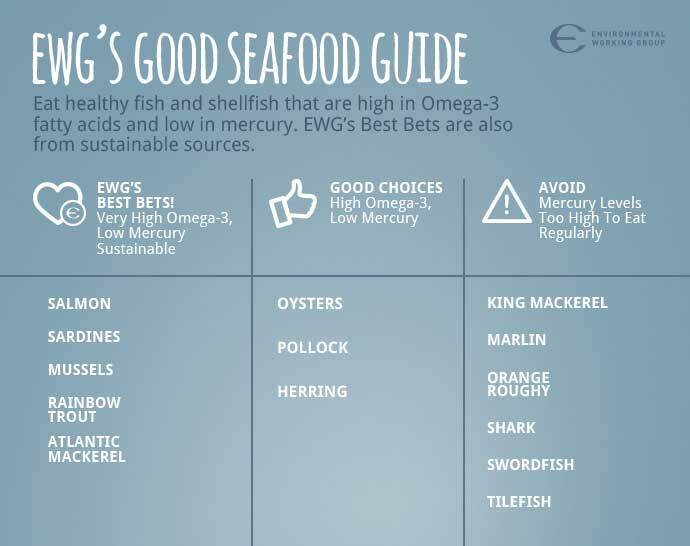 EWG’s extensive analysis of the latest scientific research on seafood, omega-3s and mercury boils down to this easy guide. Use EWG’s Seafood Calculator at the right to get your custom seafood list – based on your age weight and more - or click here to see EWG’s general recommendations. Row 1 content will load here. Row 2 content will load here. Row 3 content will load here. Row 4 content will load here. Row 5 content will load here. * Sustainability ratings for this species vary based on the location and method of harvest. Get details from the Monterey Bay Aquarium Seafood Watch program.